I know a lot of writers make up stuff as they go along. For me, my writing is always planned. I will know exactly what is going to happen in a particular chapter. I write down a detailed outline. Then, as I start the chapter, the story takes a life of its own. The characters come alive. After that, they do not listen to me anymore. It is amazing when that happens. I can actually see the scene unfolding before my very eyes, and all I have to do is quickly capture it, which I try to do as my hands fly on the keyboard. I have no idea where it all comes from. When I write a story, it just flows. Lines like the following get woven in. People tell me they can relate. People tell me I have given a voice to what they feel. For that gift I am always grateful. 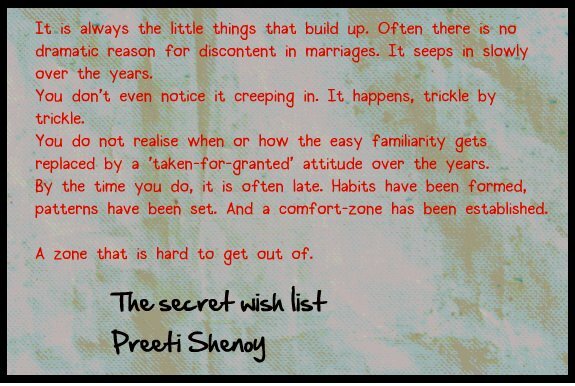 Love those lines, Preeti. and your readers are right, you know! May they keep growing and growing ! Lovely lines... and how very true they are. Finally you've revealed how you write the book!!! Do update when it would get released?? I love the way u write,those sentences, words ,alphabets , it seem as if they are floating In my hearts. Your words are magical. So are the stories you tell. Gives us hope and pushes us to live life magically. I loved your storys and the way womed lived their life. Good to know your story wrighting technique. By the way what is next from your keyboard? Another musical fountain? U have a gr8 gift of God. I remember the words of Michael Jackson when he once said he forgets that he was a singer and dancer once his show starts on stage. Everything just happens till it ends. Well expressed ma'am.Your blog always inspires me to write more and more!All I could say is that whatever I write Your blog and books definitely is the source of adrenaline. Truly awesome! Love your power of expression. Nice post. Really loved it. It always makes me wonder how writers like you can put their thoughts into words so beautifully. It is indeed a precious gift you have got. The way you described diksha her life, her journey, her soul, her pain was just an awesome experience toward reading it and feel it. This is how womens especially in INDIA are treated in being like this from there husband like in this SAMIR being the narrow-minded. It felt so genuine but after reading it on the same night i kept extracting the conclusion behind the characters each described in the book and then i came to the conclusion of my own that it is not only about the Diksha's story or survival or victory But it is about to all give a message that live your lives to the full of its extreme DO -What you want to do. Not just be a puppet of someone wishes. Make a list and make sure to complete all the ones mention in that not leave the seventh or the eight point too. Mam i am writing this as my first ever comment to an author as I really like your works (i have also read your LIFE IS WHAT YOU MAKE IT) AND I APPLAUDED YOU FOR THAT. while reading book of i asked question to my life what i want in my life ? for what i'm here ? do i really enjoy my life ? dear preeti, i think my first post got interrupted somehow. but i cannot skip commenting, as i love all ur books given the first as my all time favorite, ur books r always a life saver, when i have no clue, what to give to a friend's birthday! so, u really are a great writer, i too write stuff, but the way ur storytelling goes, it's absolute magic, and there is ur books making me v happy at times, and i wait alot for ur new release, and i hope ur writing remains as joyful and magical as it is now. wish u happiness in abundance! love from tibet! thank u mam , you are always inspiring!!! thank you mam , you are always inspirational!! !